The College of the Environment combines academic rigor and advanced learning methodologies to provide the best educational programming possible for more than 1,500 undergraduate and graduate students. 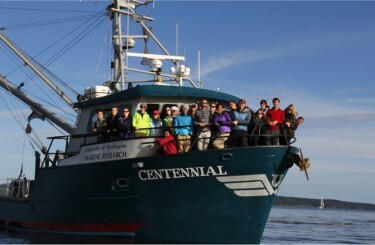 College of the Environment students aboard the R/V Centennial in the Salish Sea. The extent to which students routinely work, both individually and on interdisciplinary teams, under the close guidance of faculty and other professionals to address significant real‐world research and application problems are hallmarks of our programs. The integration of both the undergraduate and graduate educational experience into the faculty research and public service functions make the College of the Environment a highly desired place to be for students and faculty alike because of opportunities to learn from and collaborate with some of the most influential leaders in their fields. Our graduates are highly recruited by industry, government agencies, public/private companies and educational institutions. In addition, we offer a broad spectrum of general education courses that reach thousands of students every year.